Investigators within the law enforcement and cyber forensics communities are generally aware of the concept of steganography, but their levels of expertise vary dramatically depending upon the incidents and cases that they have been exposed to. Now there is a book that balances the playing field in terms of awareness, and serves as a valuable reference source for the tools and techniques of steganography. 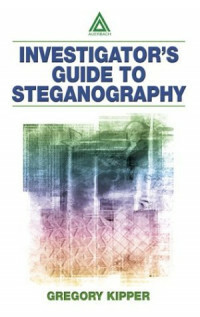 The Investigator's Guide to Steganography provides a comprehensive look at this unique form of hidden communication from its earliest beginnings to its most modern uses. The book begins by exploring the past, providing valuable insight into how this method of communication began and evolved from ancient times to the present day. It continues with an in-depth look at the workings of digital steganography and watermarking methods, available tools on the Internet, and a review of companies who are providing cutting edge steganography and watermarking services. The third section builds on the first two by outlining and discussing real world uses of steganography from the business and entertainment to national security and terrorism. The book concludes by reviewing steganography detection methods and what can be expected in the future. Greg Kipper, CISSP, works as an IT security consultant and computer forensics investigator in the Washington, D.C. area. Want to add the power of a database to your websites? Build online forms that send feedback straight to your inbox? Incorporate live news feeds and XML data into your web pages? This book shows you how to do all that and more.